Heat the broiler. Combine the peppers, tomatoes, garlic, onions, and vegetable oil in a large baking pan. Sprinkle some sea salt and place the vegetables under the broiler, about 8 to 10 minutes, or until the vegetables are slightly charred. Remove from the oven and let cool. Place the roasted vegetables, chilies, and cilantro in a food processor. Give it a few pulses until the texture is slightly smooth. Pour the mixture into a bowl and season with lime juice, salt, pepper, and stir in the olive oil. Made simple and Looks Yummm! 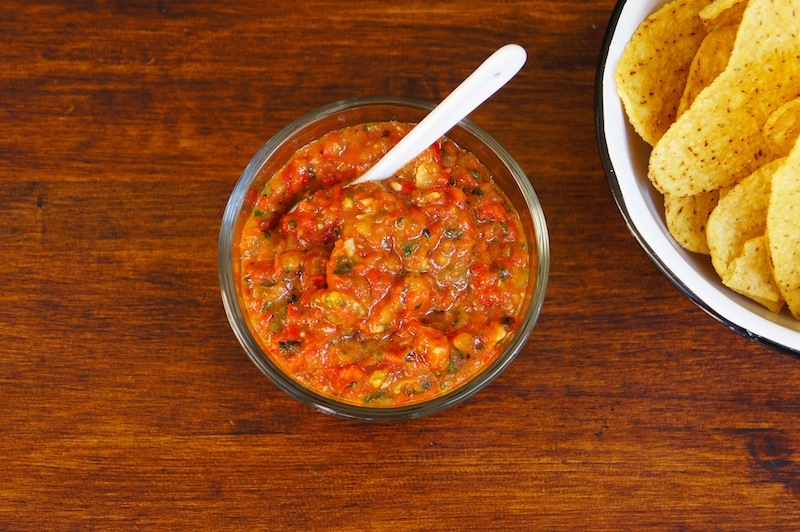 Great idea for a salsa!